Much like in the first film, English is called upon because all of England's secret agents have been taken out of commission (this time thanks to a very relevant hacker attack.) Back on the job after time working at a boarding school, English takes a decidedly analog approach to a field that's become increasingly digital in the 15 years since his first mission, eschewing the regulation mobile phone and electric car for a collection of over-the-top gadgets and a gas-guzzling Aston Martin, but some things remain the same, including the presence of a femme fatale named Ophelia (Olga Kurylenko) whose allegiances are obvious to everyone but the smitten English. A bumbling buffoon, English somehow finds his way out of every situation he's faced with (usually of his own creation), either with the help of Bough or through sheer luck. The last secret agent's mission is to find the hacker that's taken out England's spies, which brings him into the orbit of tech titan Jason Volta (Jake Lacy), who has been brought in to help with England's hacking problem by the Prime Minister (Emma Thompson, doing a thinly-veiled take on Theresa May). The film is definitely playing up the idea of old versus new, pitting English's old-school spy tricks against Volta's high-tech solutions, right up to and including the climax, which is about as on-the-nose as you can get. If you can't see where this film is going at pretty much every turn, you probably haven't watched too many classic comedies. A lack of inventiveness or surprise would usually be a pretty big problem in a comedy, but when you have a master like Atkinson plying his craft, all that matters is that it is good, and he is very, very good. Even if you see the gag coming--which you will in many cases--he still earns at the least a chuckle, if not genuine laughs. 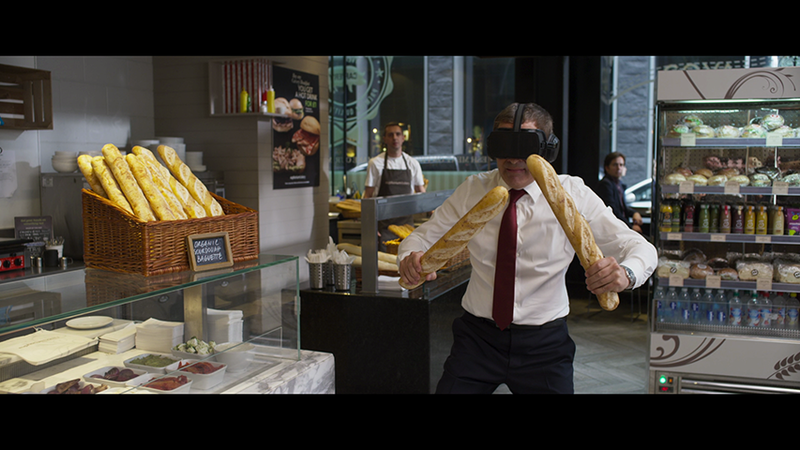 Sure, some elements which are obviously intended for big laughs don't quite land (Atkinson's dancing is silly, but without a point) but there are enough that hit to make up for it, including a grand set piece in which English's adventures in virtual reality break into the real world. It's an easy gag, but with Atkinson it works. Trying to imagine this film with another star is basically impossible. 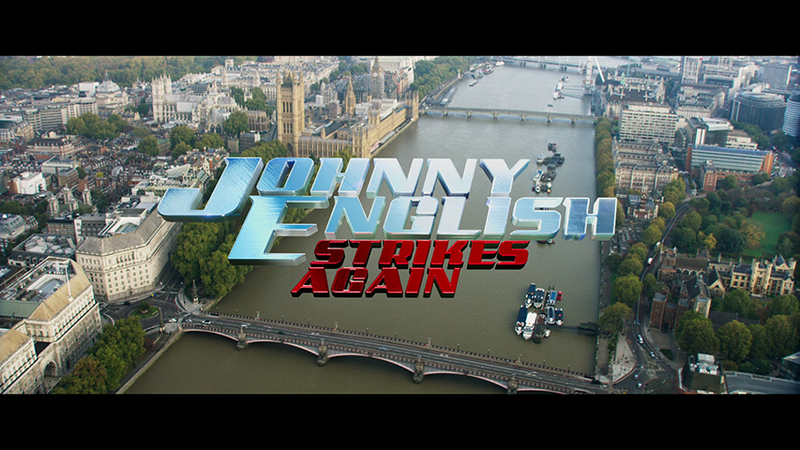 Johnny English Strikes Again arrives on Blu-ray in a two-disc release (one Blu-ray, one DVD), which is packaged in a standard-width, dual-hubbed Blu-ray keepcase, held in a embossed slipcover. The Blu-ray has a static version of menu with options to watch the film, select scenes, adjust languages and check out the extras. Audio options include English DTS:X and Spanish and French 5.1 DTS Digital Surround, while subtitles are available in English SDH, Spanish and French. Presented with a 1080p, AVC-encoded 2.39:1 transfer, the film looks tremendous, with a high level of fine detail that shows off the production detail in the sets and costuming, and a rich color palette that really shines in the film's varied environments and settings (the nightclub scene has a lot going on, as do the sunshiny outdoor chase scenes.) Whether it's night scene of espionage or a city-set daytime walkabout, the presentation handles everything with aplomb. It's not an immaculate image (there are a few digital bugaboos here and there) but there's nothing that will distract enough to take you out of the movie. Bit surprising to see a film of this pedigree get a DTS:X track, but here we are. Thankfully the track has some work to do, mainly when it comes to the film's soundtrack, including during the aforementioned dance scene, which puts you right in the middle of the nightclub. Otherwise, the discreet placement in the surrounds is notable for a few explosions and the well-delivered atmospherics, while the low-end provides heft in the beats of the dance music and the action sounds in several scenes. Dialogue isn't a key to the film, but it isn't ignored here, as voices are clear and well-prioritized in the mix. A quality presentation all-around. There's a solid spread of extras on this release, starting with an audio commentary from director David Kerr, who offers plenty of production detail as well as his thoughts on constructing comedy, including the art of editing, though he does more narrating than you'd really prefer. The rest if the extras take the form of seven featurettes made up of interviews with Kerr, some of the producers and the main cast, starting with the 4:58 "The Comedy Genius of Rowan Atkinson," which focuses on the actor's technique, including his personal perspective on his work and what it is like to work with him. His academic background and his style of collaboration are among the highlights of this piece. "A Cast of Characters" (7:12) focuses on the rest of actors, including the return of Miller's Bough, making Ophelia more than just "a Bond girl" and the appeal of the PM role to Thompson. Considering how solid the cast is, it's nice to get more info on their part in the film. "The Johnny English Legacy" (5:06), which includes a lot of clips from the previous films, looks at the appeal of the character and what he's about, as well as the process of writing the film and Atkinson's thoughts on returning to the character, as well as the possibility of a fourth film. "Virtual Reality, Johnny English Style" (4:14) covers the making of the big virtual-reality set piece, and features in-development effects work and set footage, which gives a peek into how this complex scene came together. As would be expected for a film like this, there's a 6:08 featurette on "The Gadgets", exploring the development of the old-school tools for a modern job, including the influence of the characters on their props. It ties in neatly with "The Cars" (5:07), a featurette on the vehicles in the movie, including the Aston Martin, which actually belongs to Atkinson, though it feels a lot like an ad for BMW's electric car, despite the behind-the-scenes look at how the chase scenes were shot. Wrapping up the featurettes is "Locations & Design" (4::03). This one looks at the locations, sets and the details in the design work, while also touching on how effects work has changed between the first film and this outing. In the package is a code for a MoviesAnywhere copy of the movie. The last thing one would expect from the third entry in a lightly-regarded comedy franchise is a good time, but perhaps when it comes to Rowan Atkinson expectations should be a bit higher. Either way, Johnny English Strikes Again offers up an enjoyable spy spoof that doesn't require any interest or knowledge in the preceding films. All that matters is you enjoy Atkinson's style of quiet physical comedy (this is far more Bean than Black Adder) and want to see Emma Thompson being a very good actor. The Blu-ray looks and sounds great, and there's a good amount of extras to make the disc worth owning for fans of Atkinson.